Millville, NJ - The Yamaha Champions Riding School has added a donation option to all YCRS class registrations for the Roadracing World Action Fund. "Thanks to contributions from friends, fans, and family of racers as well as from the motorcycle industry, the Roadracing World Action Fund has been able to promote motorcycle racing safety, and in particular, to encourage and facilitate the use of soft air barriers at motorcycle racing events." - RRWAF Web page. Starting immediately, YCRS student registering for an event can choose to donate to the Roadracing World Action Fund as an add-on to their registration. Over the years, YCRS has donated via the N2 Track Days Air Fence Fundraisers that have helped raise thousands of dollars and we will still continue to do that. This just adds another on-ramp to this great cause. "I'm embarrassed it took me this long to add this option. I didn't think of it in time and then got busy getting our season started," said Keith Culver, COO and CFO of the Yamaha Champions Riding School. "Air Fence saved one of our own's life last September. 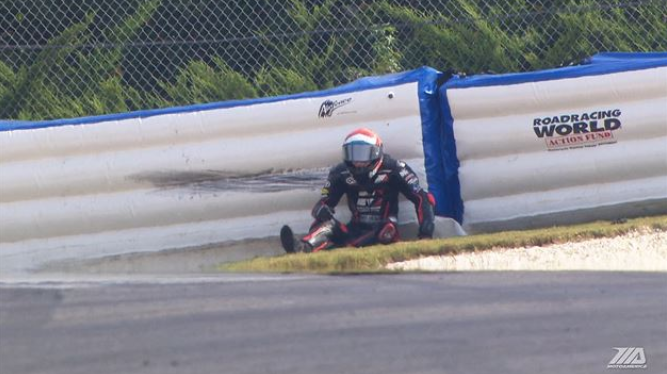 Senior Instructor Kyle Wyman had a brake failure entering Barber's turn one at 150mph; if it were not for that air fence, I can't even finish the sentence of what would have happened. After that incident, I added the Action Fund to my personal and our business Amazon (Smiles) accounts but didn't think of this idea until later." KW after sliding in at 150mph! Safe! The idea is simple: YCRS customers are awesome and because they can take a $2,200 school in the middle of the week they are doing something right in life. Our students care about riding and our sport, so why not give them an avenue to help the sport? Lower cost classes like ChampStreet and ChampDay have three options for donations: $25, $50, and $100. Our premium, and most popular product, the two-day ChampSchool, has a $50, $100, and $250 donation option. The donation options are live as of today. For any graduates reading this who wish it was an option when they registered, you can go to our schedule and donate without registering for a class. You can also go directly to the Roadracing World Action Fund website and donate directly. Please note that 100% of all donations will go to the Action Fund and we will NOT deduct the online fees that we pay for our registration site. YCRS will absorb those fees. We sincerely thank the Ulrich family for this fund and are happy to see Kyle Wyman healthy and giving the factory teams fits on the racetrack.